Hosting holiday guests may seem daunting, but we’ve got three easy ways to refresh your home for guests – and they’re all 30% OFF right now, at steve mckenzie’s, so they won’t break the bank! This “Southern Toile” design, by Adam Trest, is an absolute stunner in person and available at a fantastic price point – especially given our current promotion! And it’s offered in a range of colorways, including this delicious cranberry red, ideal for the holidays. Add a touch of sparkle with this sequin and linen pillow in a greek-key inspired design. A design like this will go with just about any decor and will be a memorable touch for guests! These polka dot linen pillows, based off of Steve’s fine art, will add a sense of fun a whimsy to a space! Blue and white is a timeless combination for interiors and when done in the chinoiserie style, looks effortlessly stylish! A desk lamp perfectly placed in a guest room offers such a warm, thoughtful touch. And the gracious lines of this lamp are sure to add a designer touch! And remember, all of these – plus SO many more – are available at steve mckenzie’s, 30% off now, through the end of the holidays! Please stop in today for best selection and let one of our team members help make selections both you, and your holiday guests will adore. We began shooting sixteen years ago determined to combine our individual talents. Before that Owen was working with some of the best cinematographers in Los Angeles as an actor and Christine was an in-demand food stylist. We had both spent a lot of time on sets observing what it took to get a great shot. Inspired, we picked up a camera and a bunch of film and began shooting. We started with food. Shortly after that a new stock agency dedicated to food photography began licensing our images. In 2001 we shot our first job. Since moving to Atlanta in 2005 we have been shooting Interiors, Food and Travel. In 2008 we acted on a long held desire to make our pictures move and began experimenting with filmmaking. This led to a number of short films and two award winning feature length documentaries. Working in both mediums provides great balance plus we get to travel a lot and work with some extraordinarily talented and interesting people. Owen: Do we each get 3 words? Christine: What have you got? Owen: Fast, edgy and dangerous. Christine: I think that describes you more than the aesthetic. Owen: Okay, what have you got? Christine: How about balanced, uncluttered and provocative? Owen: That’s why I love you. Christine: I always go first. Owen: Ok. Plaza Towers 25th floor, stunning pied-a-terre, killer view of Atlanta skyline. Christine: And the rich tones in the living room. What about the first interior project we ever shot? That beautiful home on the coast in Malibu owned by the Fluxus artist Van Schley and his wife. Owen: Wow that was so long ago and we shot it on film! Christine: And we hardly knew what we were doing. Owen: The challenge was the light bouncing off of the Pacific Ocean into practically every room in the house. But we figured it out. Christine: Speaking of the coast… what about the light in the house at Wrightsville Beach? Owen: Christine. That was an easy one. Christine: I guess I better say Owen. But really, it is Owen. When you live and work together 24/7 as a team you each bring something different to the party so it’s essential to be inspired by your partner’s vision – or madness. Owen: I always know I’m in for something challenging when Christine says “Tell me if you think this is a crazy idea.” But we don’t live in a bubble so there’s the things we see and the people we meet in our travels that influence and inspire us as well. Christine: That’s tricky. Only three? Owen: John Lennon, the Pope, and it might get fun if say, Amy Winehouse comes. Christine: The Pope choice seems off unless it’s Alexander Pope. Owen: Okay, how about Jimi Hendrix, Jackson Pollock and Howard Finster? Christine: Better. But I’d really like to cook for Joan Didion so one has to go. Owen: Wait a minute, don’t we each get three? Christine: We could be here all day… how about we move on? 5. A favorite type of space or even a favorite type of object/setting to photograph? Owen: We love the skill set of shooting interiors. It’s so exacting, like a high wire act. Christine: The placement and balance of objects. Owen: The play of shadows and light. Owen: Capturing the more intimate moments that really express the personality of the room. Christine: But there’s also a freedom to shooting the travel stories that we enjoy. Being out and about, anticipating, keeping an eye out for the shot. Owen: Because we shoot so many different things: interiors, food, people, travel, and then there are the videos too, it’s like cross training. It keeps our imaginations limber and eyes fresh. Owen and Christine: See it. Love it. Shoot it! Christine: That’s been our motto from day one. Owen: Of course our clients’ needs come first but we always try to take the shots further than they had imagined; the angle, the frame, the composition. Christine: And then there’s the lighting. We shoot primarily with natural light and Owen is the master of light and shadow so we like to wow our clients with the lighting. Christine: Owen is the house DJ, he spins, I cook. I love long hours at the dinner table or on the deck with close friends. Owen: Christine is a great cook so the dinners are always good. And then there’s the wine and the conversation. Christine: It’s like the exact opposite of social media. Christine: So you’d say social media is over? Owen: Definitely over. And out. Christine: Do we each get one thing? Christine: That way I could cook. So maybe I’d bring a knife. 9. Please share a piece of advice you’d offer to someone looking to break into the photography design industry. Owen: I’d give the same advice we were given when we started. Just do it! Christine: It’s a process and you have to work at it to find your eye. Just make sure you understand the business end of it. That can be the most difficult part for creatives. Owen: Find your passion. It’s an art form even if you’re shooting plumbing supplies. It’s a journey and you should have adventures doing it. Okay, so that was a lot of fun, right?! We need to find more dynamic duos to feature in our Tastemaker series! At least ones with such wonderful senses of humor… And isn’t their work divine. The way they work with lighting – it’s magical. And they make our spaces look absolutely phenomenal. We’re fans of Owen and Christine’s and are willing to bet that after reading this post you are too! Earlier this year, we shared a bit about how we use Pinterest – both professionally and personally – to inspire our designs and lifestyle. We had so much fun revisiting our pinboards for that post, we thought we’d bring it back and focus on our “Loft Living” board for another Pinspiring post. A huge perk of loft living are amazing, oversize windows and/or skylights. However, these windows may only be along one wall in the loft space. Make the most of those industrial windows by using light and airy colors in the largest components of the space – like the ceilings, walls and floors. Staircases are another element that can really be played up in a loft space. Think of it as a sculptural feature, which often have multiple purposes. Sure, they’re a means to an end. But, they can also act as storage, a room divider, and so much more. Don’t settle for something basic when this one element can be made in to something truly amazing. Traditional lofts can feel cold and sterile with their copious amounts of concrete and exposed piping and duct work, but vintage elements, such as exposed brick walls and hundred year old wood beams offer loads of warmth. If your space doesn’t already offer those components, add them! And then add those necessary soft items – a vintage rug and fun floor poufs (extra seating!) will be oh-so-inviting for your guests. Although there’s so much more to designing a fantastic loft space, hopefully these tidbits will provide a bit of inspiration – or should we say Pinspiration – to your dreams of living the loft lifestyle. If we can help you achieve your design dreams, be it in a loft space, Tudor home, or modern condo, please reach out to the steve mckenzie’s design team today! With the gift-giving season gearing up, we’d like to take a moment and introduce you to Rablabs, beautiful, nature-inspired accessories that are sure to be a hit with just about anyone on your list this holiday season. With stunning products, ranging from classic coaster sets to agate adorned lamps, and even jewelry, Rablabs are all one of a kind – each equally beautiful in their own unique way. Designer Anna Rabinowicz launched her first home collection for RabLabs in 2002, creating objects inspired by nature which fuse ancient, precious materials with cutting-edge design. She uses a luxurious palette of materials, layering semiprecious gems including agate and crystal with the finishing touches of pure gold and sterling silver. Anna has a long history of looking at nature for inspiration. Having designed such intricate objects as prosthetic knees and devices for cardiac surgery, she brings her experience and understanding of biology and nature to the design of elegant objects for the home. Working with skilled artisans in the United States and Brazil, her hand-crafted designs provide a much needed natural component to both modern and traditional interiors. The team here at steve mckenzie’s are especially excited about the gift-giving possibilities these fabulous gemstone rings offer… And the Rablabs agate photo frames are a guaranteed winner this holiday season! Stop by the showroom today to take a look at these amazing pieces in person, and start your holiday wish list with Rablabs! A Sputnik chandelier always makes a statement. 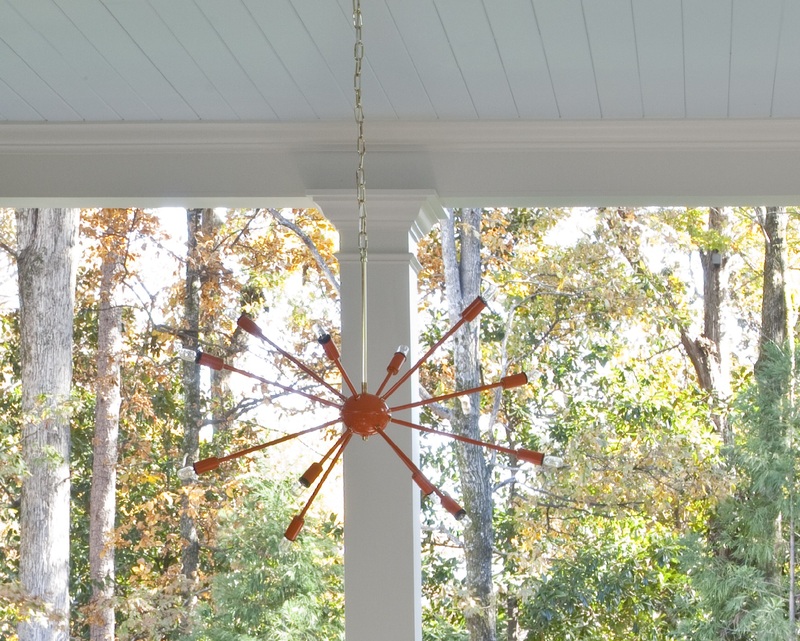 A vibrant orange Sputnik chandelier always makes a BIG statement. And that’s exactly what Steve McKenzie was going for when he had this especially funky Sputnik chandelier installed above the main gathering space in the outdoor living room he was charged with in the recent Holiday Showhouse for Atlanta Homes & Lifestyles. Believe it or not, this spunky light fixture has a place in just about any style space. Check out the “Sputnik Love” board on the Pinterest page for steve mckenzie’s, just to get an idea of all the ways these astonishing pieces can be used. Here at steve mckenzie’s we love using a Sputnik to offer a modern element and provide some creative tension with otherwise classical and traditional style. They’re especially beautiful over a classic round pedestal table in a foyer or even grouped at different heights in a soaring entry! Sputniks are fabulous over a dining table because of the openness it provides – never impeding sight lines. In a bedroom they are great over the bed, and depending on the style can really bring an element of fun (bright colors) or of luxury with crystal bulbs. The biggest pitfall to watch out for when using a Sputnik to always keep scale in mind. If using a Sputnik over a dining table, make the longest arms 2/3 of the width of the table. Likewise, when scaled too small, they can look silly especially in a grand room. If you need more of a statement, group them! Our friends at Atlanta Homes & Lifestyles also have a love for the Sputnik! 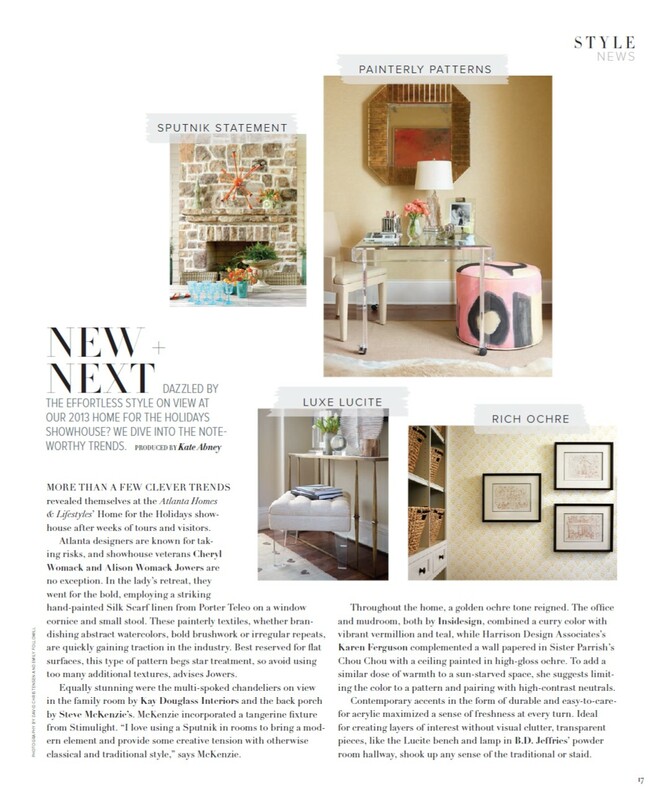 They picked the chandelier, selected by Steve for the outdoor living space, as one of the noteworthy items from their Holiday Showhouse, and highlighted it in their “New + Next” feature in the February 2014 issue! “Lighting is to interiors what jewelry is to fashion; a statement piece that can set the tone for the room. A Sputnik chandelier adds instant energy, texture and a sculptural element – without overpowering a space. 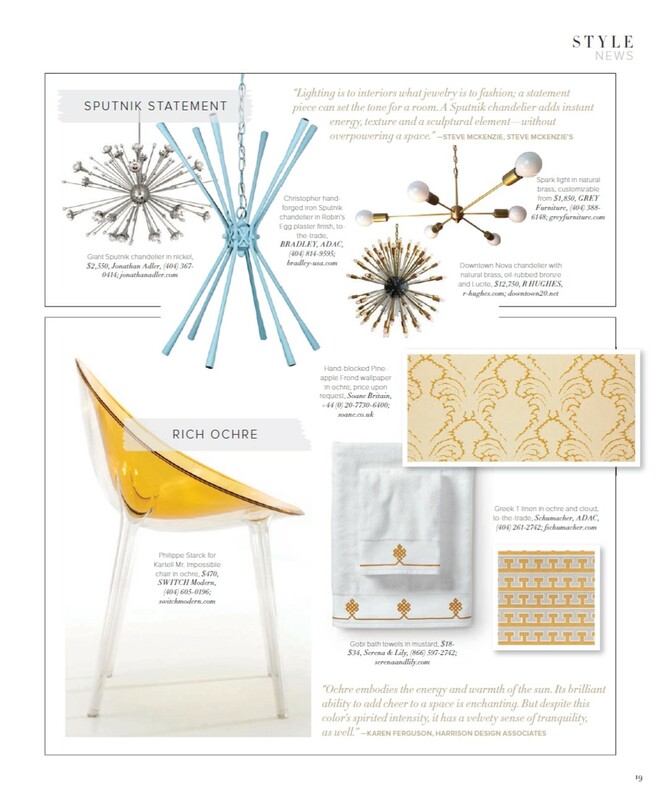 So, have you been turned on to finding the perfect Sputnik for your space yet?!? Or, if you’re lucky enough to already have your home bedazzled by your very own Sputnik, please share what you love most about it! Here’s to the jewelry that is fabulous lighting and the timelessness of the Sputnik chandelier!